It�s an inevitable question. Conventional wisdom says that the demands of an ever-growing number of humans will soon push our planet�s resources to the limit. Surely any discussion of �the future of population� would have to focus there. But two pieces of information steered me�and this issue�in a different direction. One is the history of failed projections about the consequences of population growth. The most notorious warning came from English economist Thomas Malthus, who in 1798 wrote: �Population, when unchecked, increased in a geometrical ratio, and subsistence for man in an arithmetical ratio.� In other words, mouths multiply more quickly than our ability to feed them�yet we are still feeding them. In his 1968 best seller, The Population Bomb, biologist Paul Ehrlich more specifically declared, �In the 1970s and 1980s, hundreds of millions of people will starve to death in spite of any crash programs embarked upon now.� Famines on that scale never arrived. Second and more important is why Malthus and Ehrlich were so wrong. Resources are not fixed things. Better farming can drastically increase the food supply. New energy sources enable much higher standards of living. And then behavior changes in response: More access to resources tends to make people have fewer children, not more. As a result the world�s population will probably hit its peak around 2100, followed by a historic leveling off and likely downturn. Those changes will have their own disruptive effects. We will see an overall aging of the world that could slow economic growth and fray the social nets that support the elderly. We will see more of the afflictions of old age and greater efforts to eliminate aging entirely. Today�s inequalities and environmental challenges will not go away, and may yet reach crisis levels. But mass starvation is even less likely today than it was in Ehrlich�s heyday. Human ingenuity and behavior, not gross numbers, are the real secret to understanding where our species is headed. Noted makes one think..thanks Kit! So this guy says overpopulation isn't a problem if the farmers can produce enough food? What about the energy use, the water use, the pollutiion? The destruction of wildlands? The crowded school class rooms? Hey, what about birth control? Does he refuse to slip one on? Thanks Kit, I cannot send you a green star yet, but you deserve hundreds from me. One or two kids ought to be plenty for anyone caring about the world those kids will live in. Interesting. I believe that, although resources are not fixed, we do have the capacity to increase population faster than we are able to increase resources sufficient for them. Therefore, our behavior is the bottom line. I believe it all depends on how quickly people become mature adults - if they stop with the religious fanaticism, quit the greedy "it's all mine and you can't have any", and start working together, I believe incredible things could happen. According to PBS news: "The American food chain, from the farmer to the grocery store to the refrigerator, wastes 40 percent of all food produced, according to a new study. If we were able to reduce our food waste by 15 percent, we could feed 25 million more people each year." Too bad we couldn't freeze the population at today's levels. Of course there are always pandemics caused by nature or man. "Developing countries account for more than 95 percent of today�s population growth." Yet, "The United Nations estimates that as the 21st century begins, more than a billion people lack basic needs. Nearly three-fifths of the 4.8 billion people in developing countries have no basic sanitation. Almost a third lack access to clean water. A quarter have no adequate housing, and a fifth go without modern health services." Instead of having people suffer and die from starvation, preventable illnesses, abuse, neglect, etc., wouldn't it make more sense for industrialized nations to educate people in third-world countries about birth control and provide them with the contraception they need to prevent pregnancies? Why not go straight to the root of the problem? I realize that there are those who feel that people from other countries are not our problem. But they are because overpopulation of this planet affects all of us. Rather than allow a child to have a short life filled with hunger and disease, and which will most likely end in an early death or a miserable subsistence with no hope for the future, why not prevent conception? True Susanne, but one of those nations should not be the US as our own population is expected to nearly double in the next 30 years. Thanks to climate change affecting crops and over population at home the "world's bread basket" will soon be empty. I call this the "tech fix and population stabilization model" (aka the "Hey, Presto" model). I've been reading overpopulation denialism pieces like this, often from the best intentioned liberals, for over four decades. They've changed little in all that time, and none of them have panned out. 1. At what cost to the rest of the planet? To sustain this high tech harvest nonsense every increasing levels of chemical fertilizers are being used and because of the practice of mono-culture to support this "efficiency" new pesticides are required on an annual basis to offset the adaptation through mutations of pests and disease organisms. Many of these newly developed pesticides are carcinogenic and leach into the water table. Ironically and horribly it may well be that mutated viruses will end up 'controlling' the population growth and not famine. I've heard people say before that new technologies will give us more resources. In the short term, perhpas. But we see more and more technologies have more problems than not. Even with improvements that might raise the capacity of planet earth, there will still be a limit someday. this article says Today�s inequalities and environmental challenges will not go away, and may yet reach crisis levels. So tired - all I can say is thanks Kit! People need food, but they need much more than that. Humans need housing, fresh air and open spaces. The world needs trees, but there won't be many left if we chop them all down to grow crops. And what exactly is 'better farming'? I suspect just more and more chemicals - not a healthy way to grow food. Overpopulation is not good, but neither is overconsumption. 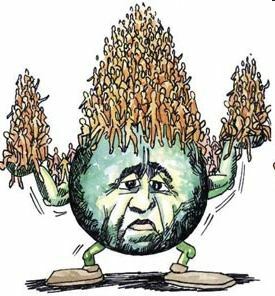 Overpopulation is killing the planet, as the bad use of our resources and consumerism!